There’s no such thing as free award travel. You will always have to pay some fees, taxes, and possibly other carrier surcharges when you book an award ticket with Alaska Mileage Plan. The question is how much? Three factors will determine how much you have to pay, and you might decide to redeem miles with a different program. Reservation fees are set by the loyalty program — in this case Alaska Mileage Plan. Some of these fees are waived for members with elite status, while others aren’t. There may also be extenuating circumstances that enable you to get fees waived for other reasons, so it’s worth asking if you think you have a compelling argument. Fortunately, the fees that Alaska charges are very reasonable compared to most other U.S. programs. $15 telephone reservations fee — If you need to call to book your award, you’ll pay $15 for each ticket. Awards involving travel on Cathay Pacific, LAN, and some complicated awards with stopovers cannot be booked online. (Try booking an award with stopovers using the multi-city search function.) You might be able to convince the agent to waive this fee if booking online wasn’t possible. This fee is waived for if you use miles from the account of an MVP Gold or 75K elite member. $12.50 partner award ticket fee — Alaska charges $12.50 per person each way for award travel on partner airlines. This is each direction of travel, not per segment, so a round-trip award will cost $25 per person. There is no waiver for this fee, even if you have elite status. $125 change or cancellation fee — Changing or canceling your award are effectively the same thing. The difference is that canceling the award will refund the taxes and surcharges already paid and return the miles to your account without booking a new award. (Any reservation fees for partner awards or telephone bookings will not be refunded.) A separate cancellation fee applies to each ticket in the reservation. Alaska Airlines will waive its cancellation fees if you change or cancel your award more than 60 days before departure, and it will waive them at any time before departure if you are using miles from the account of an MVP Gold or 75K elite member. So-called “refundable awards,” which are only available for travel on Alaska Airlines, can also be cancelled without penalty at any time before departure. Sometimes known as “fuel surcharges” — although they no longer have much to do with the price of fuel — carrier-imposed surcharges are collected by some loyalty programs when you book an award ticket. What does this mean in practice? Alaska Airlines won’t collect surcharges for the majority of award tickets booked using their miles. Two exceptions are British Airways and Icelandair. Those fees do get passed onto the customer. However, Alaska doesn’t have any say in the amount of the surcharge. British Airways and Icelandair set the numbers themselves and then tell Alaska what to collect. At the end of this post I discuss how you can look up this amount. Other airlines have surcharges, too. American Airlines and Delta Air Lines, for example, have carrier surcharges, including on some of the same routes where they compete with British Airways. But Alaska Airlines doesn’t collect those. If you fly on these carriers, you’ll pay much less in fees, although the number of miles may be different. Finally, there are some routes operated by British Airways and Icelandair that don’t have any surcharges. Such fees usually only apply to long-haul international flights. If you’re on a shorter flight, such as London to Paris, then there may not be a fee to collect. That doesn’t mean the policy is any different — if a surcharge existed, Alaska would pass it on. Here’s another example from a round-trip flight on Cathay Pacific. 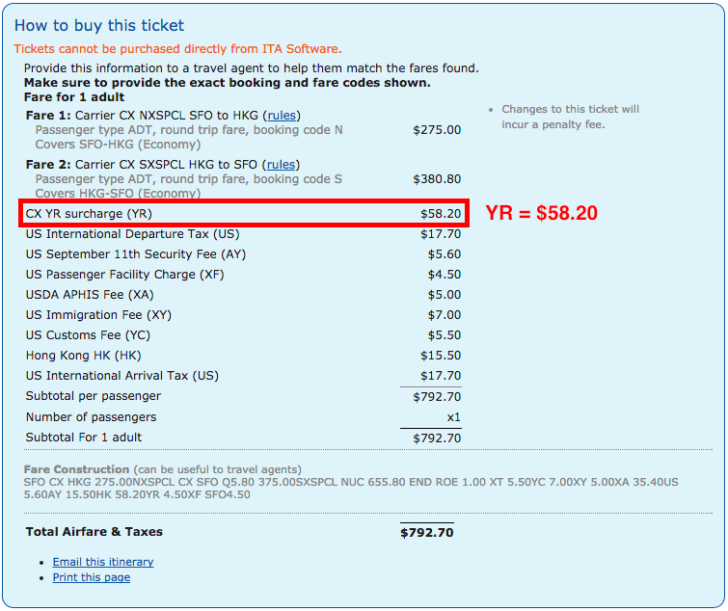 Note that the carrier-imposed surcharge is much smaller despite a trip of comparable length. But that’s irrelevant. it’s up to the loyalty program to decide if you have to pay it. American AAdvantage and Alaska Mileage Plan won’t collect it. British Airways Executive Club will. You’ll have to pay taxes with whatever program you choose, but for this trip to Hong Kong they are much lower than the trip to London shown above. After determining which fees and taxes apply to your award ticket, you can add up the numbers and check them against the price quoted by the airline when you book your award. Sometimes airlines try to collect too much — it’s true! Everyone makes mistakes. But usually they are correct. The main goal here is to make an informed choice before you call the airline so it can guide your strategy while still in the early stages of your award search.